British Prime Minister Theresa May won a crucial vote of confidence in her leadership on Wednesday, with 200 votes cast in favour of her and 117 against out of a total of 317 of her Conservative Party MPs. The vote had been triggered earlier in the day after the required 48 MPs from her Tory party filed letters of no-confidence with the influential 1922 Committee. “Whilst I am grateful for the support, a significant number of my colleagues did cast a vote against me and I have listened to what they have said,” May said in a statement outside Downing Street soon after the results were declared. “Following this ballot, we now need to get on with the job of delivering the Brexit for the British people and building a better future for this country. 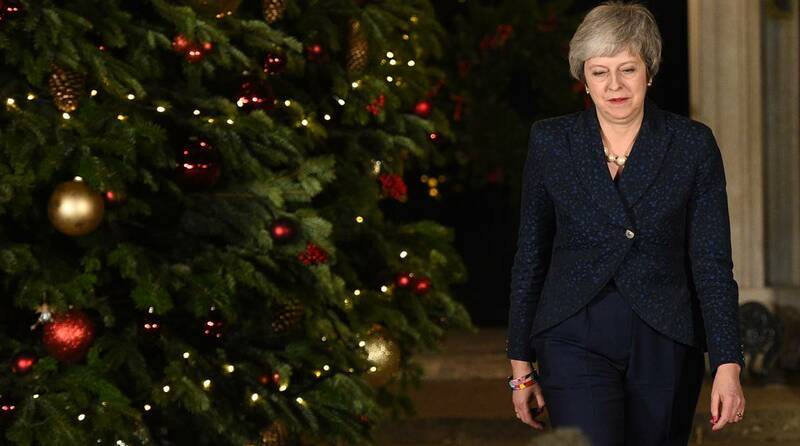 A Brexit that delivers on the vote of the people,” she said, adding that she intended to carry on negotiating with the European Union (EU) over controversial aspects of her Brexit deal when she heads to Brussels for a pre-scheduled European Council meeting on Thursday. The verdict of the confidence vote was formally announced by Graham Brady, Chair of the 1922 Committee made up of Tory backbenchers, who revealed that the Parliamentary Party “does have confidence in Theresa May as leader of the Conservative Party”. Under the party’s rules, May’s leadership cannot be challenged for at least a year now. The MPs, unhappy with the Brexit deal May has struck with the EU, began voting on her future Wednesday evening. A majority of the MPs had publicly said they would be voting for the PM but as it was a secret ballot, there was uncertainty over the result. May was reportedly greeted with applause, and the traditional banging of desks as she went into a House of Commons Committee Room reserved for the vote to address her MPs before they began casting their ballots. In her impassioned plea to the 1922 Committee, she told her colleagues that she had listened to all their criticism and confirmed that she would only hang on to Downing Street to see Brexit through before stepping down. This would mean she would not lead the party into the next General Election, scheduled for 2022. “She was very clear that she won’t be taking the General Election in 2022,” said UK work and pensions secretary Amber Rudd. The plea seemed to have paid off in the end as she survived the vote, turning the attention back to securing a Brexit deal that is acceptable to all sides of her deeply divided party as well as a fractured Parliament. “I will contest that vote with everything I have got,” May had said in a statement at Downing Street, warning that the leadership challenge will delay or even cancel Brexit. May needed to convince a majority of her party MPs and a minimum of 159 votes to win the contest. OPINION | A PM on the run! Had she lost, the party would have had to elect a new leader who would then go on to become the next British prime minister. May would not have been able to stand for such a leadership contest but would have to remain in Downing Street as caretaker PM while the process to select a new leader was conducted. Some possible frontrunners named in the UK media included former UK foreign secretary Boris Johnson, current foreign secretary Jeremy Hunt, home secretary Sajid Javid and Rudd. But there did not seem to be a candidate with consensus across the pro and anti Brexit wings within the Tory party. In her defiant statement on the steps of Downing Street soon after the no-confidence vote was announced on Wednesday morning, May said changing the Conservative Party leader would “put our country’s future at risk and create uncertainty when we can least afford it”. She said: “A leadership election would not change the fundamentals of the negotiation or the Parliamentary arithmetic. She said she was making progress in her talks with EU leaders and vowed to “deliver on the referendum vote and seize the opportunities that lie ahead”. The Conservatives had to build a “country that works for everyone” and deliver “the Brexit people voted for”. “I have devoted myself unsparingly to these tasks ever since I became prime minister and I stand ready to finish the job,” she said. The leadership challenge came as May was desperately trying to rescue her Brexit deal as she tried to convince EU leaders to offer some concessions to convince Britain’s MPs to vote for it on Tuesday, a day after she postponed a crucial parliamentary vote scheduled for this week over the Withdrawal Agreement struck with the EU. She was due to travel to Dublin on Wednesday but remained in London to contest the no-confidence vote. European Commission President Jean-Claude Juncker, who held talks with the British PM in Brussels on Tuesday, said the EU would not “renegotiate” the deal but there was room for “further clarifications”. “The deal that we have achieved is the best deal possible, it is the only deal possible,” he reiterated. Britain’s MPs have to give the go-ahead for May’s deal if it is to come into effect when the UK leaves the EU on Brexit Day — March 29, 2019. But deep divisions remain on all sides of the House of Commons over the so-called “backstop”, a temporary customs arrangement designed to prevent the need for checkpoints at the Irish border if a long-term solution between the UK and EU cannot be agreed post-Brexit.